Was feeling very tired and always have very bad shoulder ache I guess most of the desk bound people will get this cos due to long working hours on the PC. Overheard what my in laws all raving about this TCM saying that she have help them in relieving some sickness and aching. So I asked my MIL to help me book one session with her ..... my appointment with her was 730pm. So before my dinner I just went in .... told her about the aching and I told her that I am actually wanna get preggy again haha .... so she told me if I am ok she will give me some chinese powder but i hate that smell so i didn't take any from her. 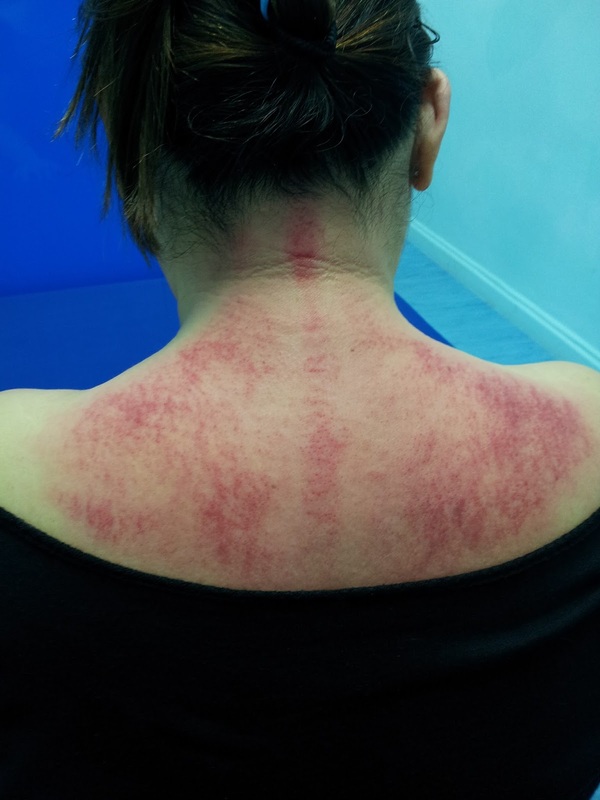 After that she told me she wanna do accupuncture for me ...but I opt for Gua Sha instead ... is really painful ... this is the first time I am doing it! Immediately my back become very red ...... and I really feel better after that ..... is really relieving but is really painful till I wanna cry! TT came over and this little sweetie of mine comfort me she feel that I am in great pain with the redness on my shoulder that really melt my heart! And I have to wait till 11+pm then I can bathe ..... gotta come back for more as doing gua sha is only 制标不制本!